I am doing paid work on a Shopify site. I had to quickly learn a new template language called Liquid. Liquid was created for Shopify, but is also being used in other Ruby on Rails web applications. Somewhat limited language (no math, not much in terms of string manipulation), but it is elegant. I am reading the very enthralling and useful book Designing the Moment by Robert Hoekman Jr.
A first release candidate of Drupal 6 was made available on December 20, 2007, that is, two days prior to the publication of this theming guide... which covers Drupal 5! Drupal 6.1 has since been released, and many of Drupal’s most popular add-on modules are now ready for use on production web sites. 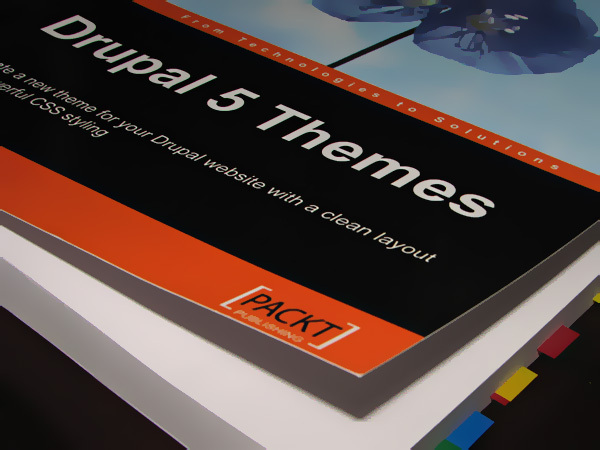 The author mentioned on his blog that an updated version of his book will be published, but Packt Publishing is not yet listing 'Drupal 6 Themes' among its upcoming publications. Still, I read the book, and worked through its examples on a Drupal 6 install. As a somewhat seasoned Drupal developer, I still found the book helpful. I recommend it, provided that, as you read along, you refer yourself to the concise (and well-put-together) Drupal 6 theming guide available on Drupal.org. Theming has definitely taken a leap forward in D6. For instance, intercepting and overriding theming functions is a lot easier now.